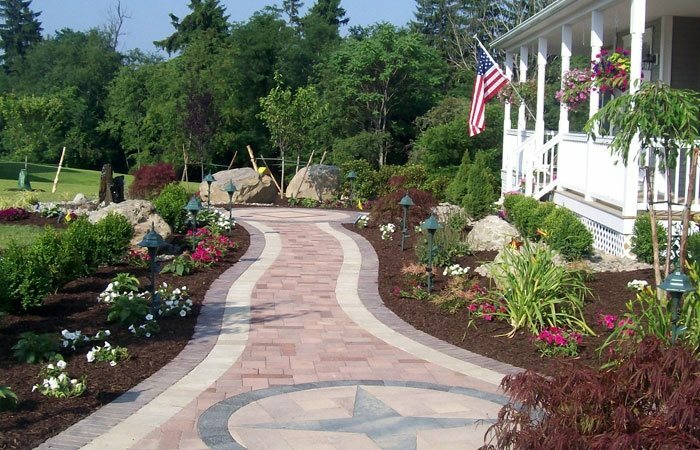 Pavers are a very versatile walkway paving material. 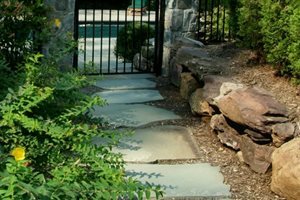 They can be used to create a simple path or an elaborate entry walkway. 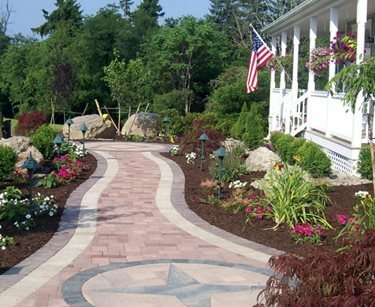 Walkway pavers come in many shapes, colors and textures and can be laid in a variety of patterns. 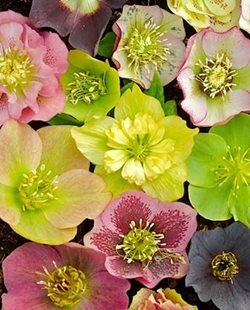 They are typically placed over a bed of compacted soil and gravel, so you don't have to worry about cracks. 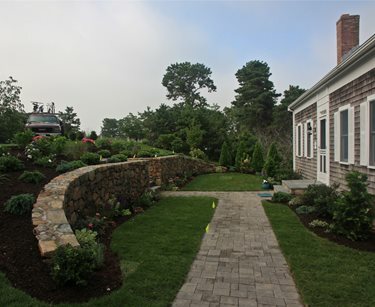 This undulating walkway is a beautiful example of how colored unit pavers can create truly remarkable effects. 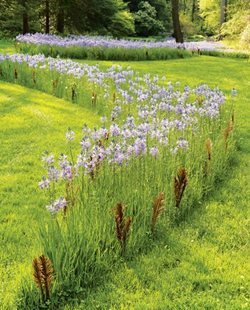 The uniformity of this material provides the opportunity for the lavender and white bands that accentuate the subtle curves of the layout. A field of irregular pavers provides a magenta surface that beckons users to travel from one circular paved node in the landscape to the next one in the distance. This wide walkway would not be nearly as appealing without so much variation in color. 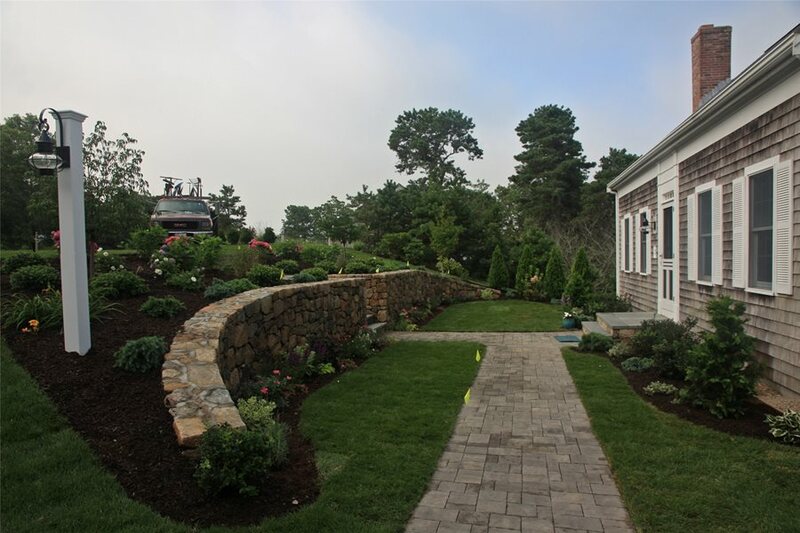 Muted color and tumbled rustic pavers are the perfect solution adjacent to a retaining wall made of real stone. The wide range of unit sizes produces a naturalistic feel despite the straight, very rigid alignment of the walkway. Pavers selected to coordinate with the color of the house appear to have been there for a long time, despite the fact that this is a brand new walkway. 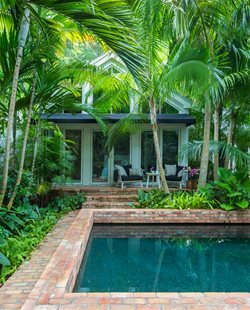 Tumbling pavers in a hue that mimics natural stone is one of the best ways to achieve this age old look within a modest budget. 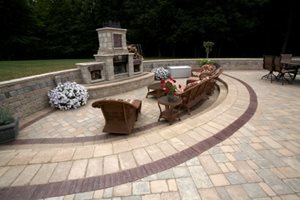 When brick is existing within an older homesite, the best choice is to continue on with this most traditional unit paver. 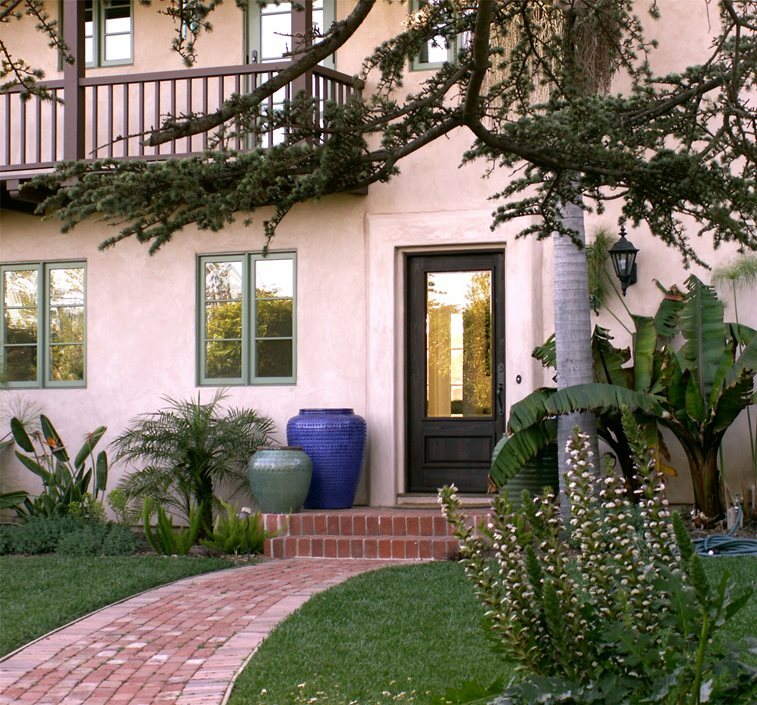 Here the front entry walk features used brick laid on an aggregate base without mortar to provide a permeable surface. When laid end to end. 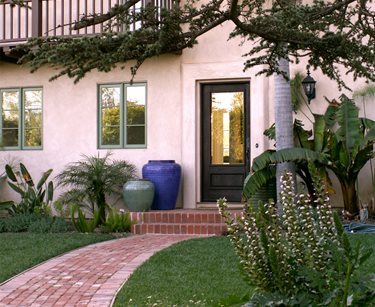 a running bond pattern is a subliminal way to make the entry more inviting. A soldier course of brick produces edging that gives the brick more stability. 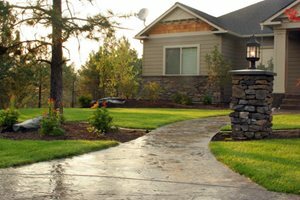 Wood bender board holds this outer course in place, protecting it from the perpetual battering of lawn mowers and edging machines.